RORATE CÆLI: What time can Midnight Mass begin? What time can Midnight Mass begin? As we mentioned previously, 24 December is the Vigil of Christmas, which takes precedence over the Fourth Sunday of Advent. Thus, the Fourth Sunday of Advent is not commemorated this year using the 1962 missal. The following day is, of course, the feast of the Nativity of our Lord, the first day of Christmas, on 25 December. A popular question in novus ordo circles is: What time does Midnight Mass begin? The novus ordo is not our concern, but if the question is about the traditional Latin Mass, the answer is clear: no earlier than midnight on 25 December. There is no permission to use the next calendar day's propers for the traditional Latin Mass on the evening before a Sunday or holy day, even at 11 p.m.
4. Dies liturgicus est dies sanctificatus actionibus liturgicis, praesertim Sacrificio eucharistico et publica Ecclesiae prece, id est Officio divino; et decurrit a media nocte ad mediam noctem. 4. The liturgical day is the day sanctified by the liturgical rites, especially the eucharistic Sacrifice and the public prayer of the Church, that is the divine Office; it runs from midnight to midnight. The rubrics go on to explain more solemn days, such as Sundays and holy days, have an Office that starts the evening before. But it is very clear the rubric is talking about the Office -- that is, First Vespers -- not the celebration of Mass. 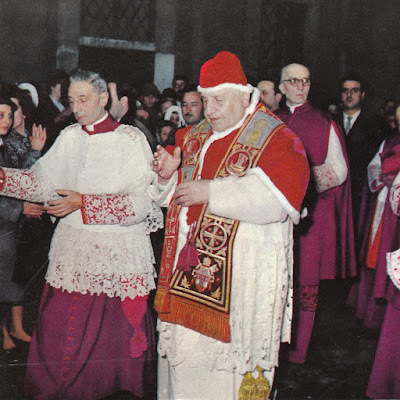 Before the reforms of Pius XII, Mass was only celebrated in the morning; following the reforms of Pius XII Mass can also be celebrated in the afternoon or evening. But nowhere was permission given to "anticipate" the next day's propers, which seemed to begin following a 1967 instruction allowing one's obligation to be fulfilled the evening prior to a Sunday or holy day. To be clear, we are not talking about one's obligation, which is now enshrined in the new code of canon law, binding on all Catholics. We are talking about the Mass propers, which is governed by liturgical law, with canon law silent on this issue. Based on the 1962 rubrics, Midnight Mass (Christmas Mass During the Night) must begin at midnight. A 10 p.m. or 11 p.m. Mass on 24 December, while technically fulfilling one's 25 December obligation, must use the violet vestment Mass of the Vigil of the Nativity of our Lord, the same Mass propers used earlier that morning.